So, you’ve decided to pop the question—congratulations! You probably can’t wait to walk down the aisle, see your bride in her wedding dress, and start a new chapter of life together. Before you get ahead of yourself, though, you still have to buy the ring and plan a proposal. If you wanted to, you could find a ring that cost more than $1 million. Odds are you don’t have that kind of budget, though. Luckily, there are a lot of options for those with budgets that are much smaller than $1 million. 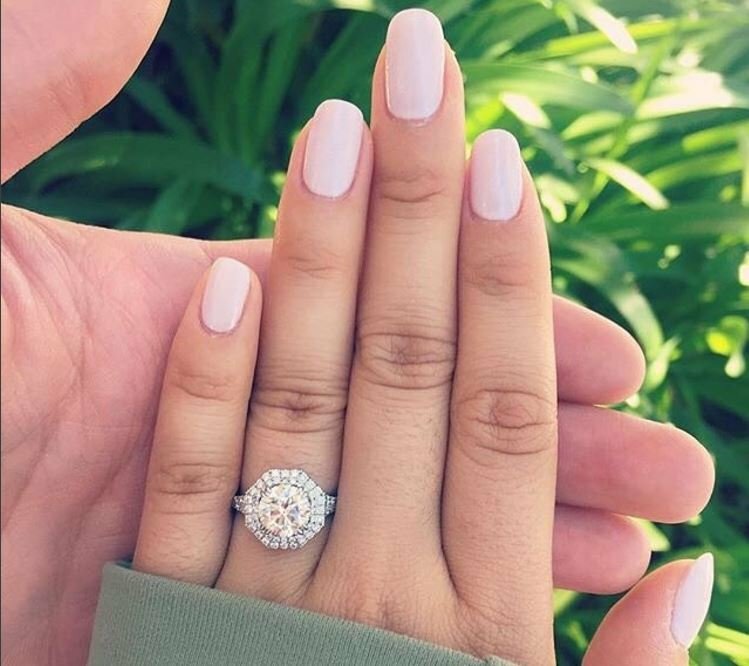 Even if your budget is only one or two hundred dollars, you can easily find an affordable, (but beautiful), ring to use until you can afford the ring of her dreams later on. The average American spends nearly $6,000 on an engagement ring, but ultimately, how much you can and want to spend is up to you. Sit down and look at your budget, evaluate how much you have to spend, and give yourself a firm price range. If you don’t set an amount, it will be easy to overspend which could put you in a financially tough spot. After you’ve determined your budget, it’s time to start looking. There are a lot of different wedding ring styles out there from classic and simple with a solitary stone, to unique sets with shaped bands and colored stones. Even if you know what style you want, you’ll have to decide what type of cut you want for the stone, what type of metal, etc. There are a lot of options. If you aren’t sure what style your fiancée will like best, try doing some sleuthing and looking at rings she already owns, looking through her Pinterest boards, or enlisting the help of her family and friends in whom she has confided. If you feel confident you know her well enough to choose something she’ll love, you can give it a go, but always be sure to ask about the store’s return and exchange policy if you’re surprising your intended. Diamonds are the stone that most people think of when they think of engagement rings; however, they aren’t the only option. In fact, a lot of people are transitioning away from diamonds and opting for alternatives because of concerns with ethics and even with value. If you’re interested in other options, you can choose from other stones like amethyst, turquoise, emerald, ruby, sapphire, garnet, morganite, pearl, topaz, and other unique stones. If you’re interested in a certain stone, but want to save up to purchase it later, you could even choose a more affordable, “placeholder” stone-like moissanite in the meantime. If you’ve already started looking at rings, chances are you’ve heard of “the four Cs” of gemstones. The four Cs are carat, color, clarity, and cut. Carat refers to the size of the stone which can range from 0.05 to one, two, or more, (although the larger the carat, the gaudier, heavier, and more expensive the ring will be). Color doesn’t refer to the different colors of different gemstones; it refers to the color grade. Whether visible to the naked eye or not, some gemstones can be slightly discolored or off-color from the standard, and the color grade will sometimes affect the appearance price of a gemstone and ring. Clarity refers to how clear the gemstone is, whether or not it has flaws and blemishes inside, etc. And finally, cut refers to the shape and if it is cut slightly too high or too low which can affect the way a gemstone reflects light and shines. These are all things you’ll need to consider and want to discuss when you go out shopping for rings. Just like gemstones are different, so are metals. Rings made from sterling silver are typically lower quality because they will scratch and dent more easily than metals like white and yellow gold. Not only does the quality of the metal matter, but so does the appearance. Depending on your loved one’s preference, you may want to choose rose gold over yellow gold. If she prefers cooler colors, though, then white gold is the way to go. Finally, one of the most important things you’ll need to know before you make that final purchase is your fiancée’s ring size. While rings can be resized if necessary, every girl dreams of getting a ring she can slip right onto her finger and wear without alterations. Whether you use one of her existing rings to compare, tie a string around her finger to measure while she’s sleeping, or ask a friend to casually ask on your behalf, you’ll need that ring size before you go shopping. Do you have a good idea of the type of ring you want to buy? Why Should the 4Cs Influence Your Choice of Diamond Ring?